This is my second nail post of the day but I think for the first time they are my natural nails! The only reason why this is because over time of having my nails done at the salon they were in terrible condition which is normal, thank god before getting the nails done in my last post I let my natural ones grow stronger and healthier or else they probably would of fell off by now! ( Not literally though haha, bit exaggerated…) In all seriousness they were in very bad condition so I decided to research nail designs to practice on my natural nails as they grew longer, after all its not like you have to have boring nails just because they are a bit damaged! Anyways I mainly researched pointed nail designs because they are gorgeous and so feminine! Well I think so :). 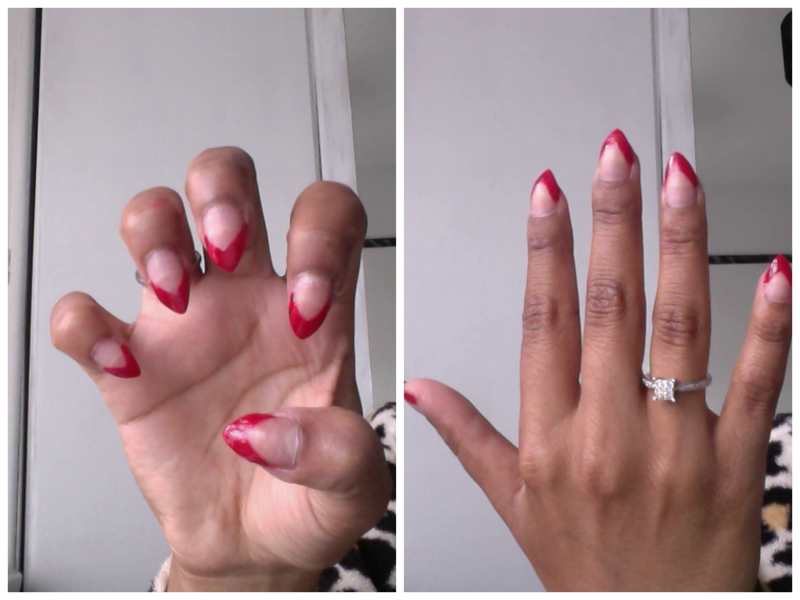 Whilst researching I came across Lana Del Rey’s signature red pointed nails and since they were not complicated to recreate I thought why not give it a little go….. This is what the lovely Lana’s nails looks like…………. Here is my recreation of this look, my nails are a lot shorter then Lana’s which makes the look less bold. What do you think, would you give this look a go?